Interested in networking your Arduino? In addition to this shield, see our new DFRduino Ethernet shield. "Hello World" indeed! This fully assembled Arduino Ethernet Shield allows an Arduino board (Diecimila/Duemilanove/Mega/Uno) to connect to the Internet and/or other computers/Arduinos on your network. It is based on the popular Wiznet W5100 ethernet chip. This latest version includes a micro SD memory card slot, so you have massive storage for your projects! 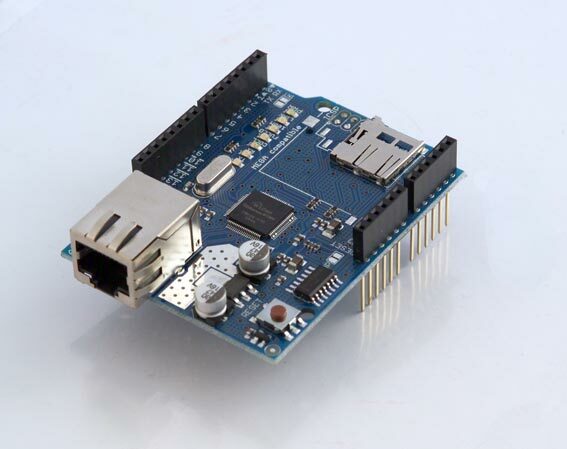 Follow the Ethernet Shield Getting Started Guide, and your Arduino will be talking to the world!